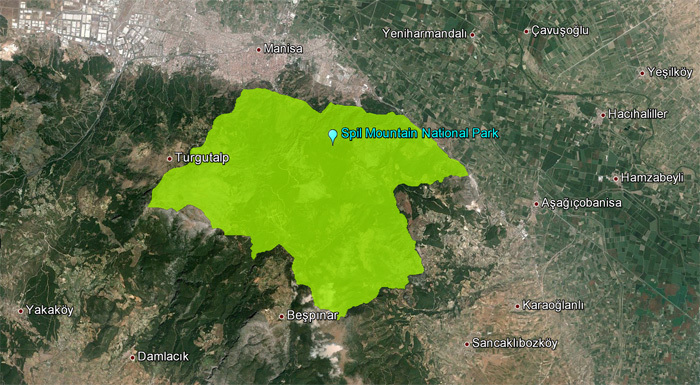 The Spill Mountain is 24 km from Manisa in Turkey. Manisa can easily be accessed by private and public transportation. The Spil Mountain National Park is known for its mythological and historical points. You will also find a wide variety of flora and fauna. Cavernous developments in the area have resulted in many canyons, caves and steep valleys. The main species of trees here include pine, juniper, poplar, walnut, elm and oak, 20 of which have been determined in scientific research as scarce. Also found here are the Manisa tulips, which gave their name to a period of the Ottoman Empire and were taken to Europe. Species of wildlife living in the park include bears, jackals, roe deer, foxes, badgers, wild goats, vultures and eagles, and there is also a pheasant production farm. You can find some great furnished housing options in the area when visiting as well as camp sites. Spil Mountain National Park is rich in history with many myths. According to one, the mountain was named after Cybele, the wife of god Cronos where she is carved into the rocks in Akpinar. But another myth states that the mountain was named after Spilos, the daughter of Friesian king Menos, who was kidnapped, left at the mountain and brought up by wild animals. Tantalos, the king of Lydia, built a luxury housing castle here and to celebrate, he sacrificed his son to the gods, for which he was later punished. The area known as Crying Rock (Aglayan Kayalar) was so called, according to mythology, because Niobe was crying for her 14 children killed by Leto. The caves in Dulkadin were once used as homes, and some of the remains of this period are exhibited in Manisa City Museum. The structure of the area is suitable for mountaineering, climbing and trekking. Ataalani is a good place for camping. Sulukle Lake, which is covered with leeches, is on the east of the national park and 600 m long. It has formed as a result of the lime base dissolving, and many caves developed because of the water eroding the base, the largest of which is Pasaini. The Spil Mountain National Park is also well known for its hot spring, which is around 21°C. Manisa is situated on the North side of Izmir,it is located between Spil Mountain and Gediz River.It is 36 km away from Izmir and stands as one of the most important cities of the Aegean Region. According to Homer,the first settlement was commenced in 14th century B.C. by Magnesians after the Trojan Wars. Manisa, cradle of many civilizations such as Hittites,Phrygians,Lydians,Romans, Greeks,Byzantines,Seljuks and Ottomans, It was called Magnesia in ancient days. The city was conquered by Saruhan Bey in 1313;and its name was changed as Manisa after becoming the capital of the Saruhan Dynasty. Sultan Mosque was built upon the request of Hafsa Sultan,the wife of Yavuz Sultan Selim and the mother of Süleyman the Magnificent.It is situated in the Sultan Complex.In the past,Turkish bath of the complex was free of charge, and food was available for homeless people at the public kitchen.Many diseases were cured at the hospital of the complex.Mesir paste was first prepared by the director of the hospital,Merkez Efendi.This paste contained 41 different spices.